-> When you choose to hire our architect in Ahmedabad, we will have one of our experts cater to the specific needs of your project. Based on the specific needs of your project, we will come up with a plan as to meet your architectural design goals. -> We can also present you with a number of great design ideas and concepts that you can choose from. If you like any of the design ideas, we can immediately start working on it. Alternatively, we can also implement any kind of customizations that you want us to do. -> Once the design concept is chosen, our team of architectural designers and professionals will start working on your project based on the specific instructions that you have provided our teams. -> We always maintain a flexible approach to our work that enables us to accommodate any kind of design concepts of our customers. We are also prepared to implement any kind of feedback that our customers may provide us so that the quality of work is improved greatly. -> We only make use of the latest and most advanced technological tools in order to create the designs of any kind of project. This makes it possible for us to enhance the quality of our work at every step of the way. Over the years, we have created a strong market reputation for ourselves by providing people with superior quality architectural designs. This has led our customers to review us in the most positive light. We find most of our customers through word of mouth which speaks a lot about our work. So once you decide that you need to hire an architect in Ahmedabad, contact us at iArc Design for the best support. We have distilled our interior design process into 4 Steps, the same steps we have been using for more than 18 years, In this steps, the designer visits your home to gather more. After design selection our staff will start the work with proper guidance of designers. After work done we always take a feedback from our clients. 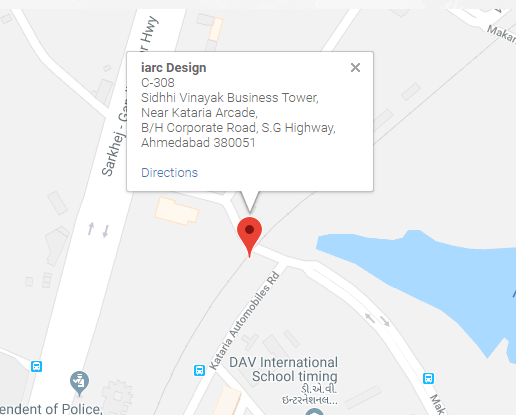 iArc Design Established in year 2007. iArc design is a recognized design build firm providing interior designing, planning, construction and consulting services to discerning clients in Ahmedabad, Gujarat. “There are no short cuts to building real trust". it all begins with listening to our clients, understanding what’s important to them, adding value, and following through with design, construction and genuinely sincere service.